First of all, Charlie’s was awarded the prize of “Best coffee bar 2017” in Flanders and Brussels. So it’s fair to say that you can’t go wrong here if you are into good coffee. There are plenty of variations you can try (The menu holds 2 pages of coffee variations) and because ‘healthy’ is a buzzword here, you get more than the sweet variations you would get in a bar like Starbucks for example. They combine flavours by using Belgian products or special kinds of milk, like oat milk or rice milk for example. Luckily, even though I know a few places in Antwerp that could easily compete with Charlie’s if it comes to coffee, there is more than coffee that makes me love this place. It’s the home feeling, the we-are-all-friends kind of service, the old mansion-of-dreams interior and the peace. I rarely see business meetings, people with laptops or anyone asking for the WIFI-code here, which is something you would expect from a coffee bar in the city. 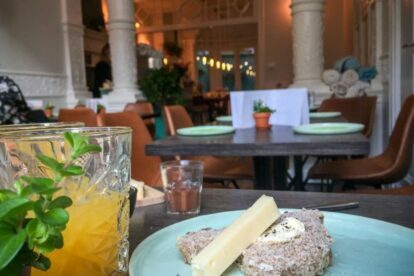 Besides the good coffee, the magnificent interior and the great atmosphere, they also serve breakfast and lunch, which generally comes with surprising, fresh, healthy and tasty ingredients and products. Think about cheese with seaweed, home-made lime jam, home-made hazelnut chocolate paste, freshly made humus and salads. Looking for a zen place to remember? Have breakfast or lunch at Charlie’s. At least have a coffee!